finally designed, naturally air fights took place at the new heights and pilots began to have new kinds of malfunctions that were traced to the extreme cold at these altitudes. Reports of stoppages became so prevalent that electric heaters were improvised by ordnance mechanics in collaboration with field electricians. Finally when a heater was made that proved aderpiate, manufacturing drawings were sent to the Vickers Co. and it was mass produced. The greatest percentage of stoppages at high-altitude firing came from the gumming up of oil on the mechanism and the resulting sluggish movement caused excessive jams. To correct the situation, the parts were heated by copper pads on each side of the weapon, held in place by the same bolts that secured the cam. As all the moving parts were at one time or another brought into contact with the cam. it was felt that, if the latter was kept hot. it would in turn keep them warm enough to function smoothly under any cold encountered. The weapons were also aided by the type of mountings used. In most cases they were placed in recesses in the cowling with only the top half of the jacket and the bore of the barrel uncovered. 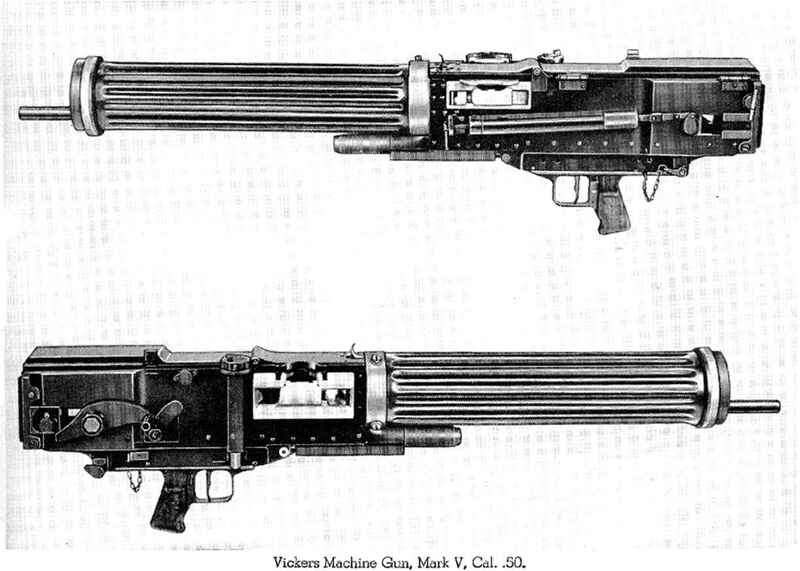 To operate the Vickers high-speed aircraft machine gun, the pilot gunner first places the brass tag end of the cartridge belt, if a fabric belt is used, through the feed block from the right side. With the left hand he pulls it through as far as it will go. At the same time the crank handle is rocked back on its roller to its full limit, and while in its rearward position the belt is again pulled one more space, indexing the incoming round.